We bid a fond farewell to Jessica Kirckpatrick and thank her for a fascinating week talking about data science, STEM diversity, and outreach. We’ll catch up with Jessica again soon, so keep your eyes peeled! 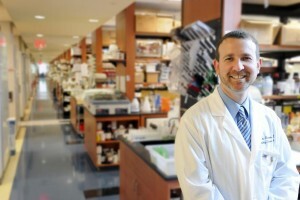 We’re moving to the East Coast USA again now, to meet out next curator, Associate Professor Adam Marcus (@notmadscientist), from the Department of Hematology and Medical Oncology at the Winship Cancer Institute of Emory University. Adam works on the metastasis (spread) of cancers through the body. Originally from New York City, Adam has been living in Georgia and working in cancer biology for over 13 years. He’s even given a TEDx talk (see below) on his work. Here’s Adam in his own words. I was fascinated when I took Biology in high school, then realized in college that I was only being taught the tip of the iceberg. Yet again in graduate school biology I had the same feeling. Now that I have been doing this for over 13 years, it is not that I have been taught only the tip of the iceberg, we only know the tip of the iceberg. In the most general sense, I can help answer questions that have never been answered in the history of humankind. More specifically, I am drawn to cancer due to its complexity and lack of thorough understanding about how it works. Though I realize I am a small piece of the greater international effort, I want to at least try and make a difference in the lives of cancer patients. Each year in the United States alone we lose close to 600,000 people from cancer (American Cancer Society). This is almost the same number of deaths as there have been in all US war combat-related deaths combined (~850,000). Similar numbers are seen worldwide. In order to change this it is important that the public is aware of this dreadful disease and its impact on our global society. And what interesting hobbies do you have? So, form data science to cancer molecular biology, please welcome Adam Marcus to Real Scientists!